As previously described, due to the closedown of Google Plus, content I currently collate there will be relocated. I am currently looking into a free wordpress.com site to replace both the existing website (trainweb) and the Google Plus collations into one site. Trainweb has been very good and I will continue to use it in some capacity but maybe just as a redirect. If Trainweb were to update to being a Wordpress host or map their existing domains to the free Wordpress hosting option then I would seriously consider using that, in fact it's highly likely I would use them. Wordpress.com's free option is essentially a blog. This page you are reading this on is a Blogger blog. It is not feasible to migrate this blog to Wordpress as well, because of the costs involved, and the amount of work needed to accomplish this process. So this Blogger blog will just continue to be used as it is. So the net outcome would be that this blog stays just as it is now and continues to host all of the existing posts and also continues to receive new posts. That is all working fine for me and I have no intention to change that. A Home page which links to the pages that contain the content. Essentially this will look like the home page of the Trainweb site and therefore link to the other sites as well as to the global data (indexes and keys) and the twelve volumes of the project (at the moment these twelve volumes are what is hosted on Google Plus). In effect these pages are thirteen volumes because we put the index/keys page as Volume 0. The thirteen volume pages contain links to other content. Essentially they would be thirteen posts, one for each volume, and the content will be the other sites. At the moment in Google Plus the content is links to Flickr, Scribd, Google Photos and this blog. I still have to investigate using tags to index content because the other option instead of having thirteen static pages is to have a page for each tag, just like the Volume tags on this blog (e.g. this post is tagged Volume 0) and then the thirteen volume pages are displaying tagged articles for each volume. This option means that a different way of organising the content is to have a new post on the Wordpress site for each piece of content. This means that also, new blog posts on this blog might be able to be auto syndicated to the Wordpress site and tagged automatically. However this might not be possible to achieve with the free Wordpress.com site. I have absolutely no intention of paying for a commercial Wordpress.com site, not because their hosting isn't good value or worthwhile, but largely because the scale of this project doesn't warrant commercial anything, in my opinion. It is essentially a philosophical choice I have made about this project for myself. The content itself is completely free and will remain so. I just wish to focus my efforts on that content and not on building a web site, so free sites have builder tools that speed things up and I wouldn't have the time to use the extra stuff on a paid site. The only real advantage is being able to use your own domain name. So these options are currently all being considered. In the meantime the existing web site pointed to by www.nzrailmaps.nz continues and points to Google Plus collections. Google announced three weeks ago they would be closing Google Plus down. The NZ Rail Maps project does use Google Plus to collate links to some of our content. We don't actually host content on Google Plus itself but we do use other Google services and these aren't affected. Because of this change in Google Plus I have to decide what is the best way to collate this content. I do have a number of options but I do naturally want to keep with a free web hosting option in the short term. However this may be a time to consider low cost web hosting but because the domain name redirects to a free web server that is very reliable and long term committed, I do also have the option of keeping that as is and either leveraging off that to another free web host or building a full site around that. Many years ago I did create my own web site builder software for Windows to build a number of Trainweb sites. Being on Linux I don't expect to pick that up or run the site builder on Windows again. So there are a number of possible options to consider. Google Plus will not be offline until next August so there is plenty of time to look at options. The web home page has been changed to point to Google Plus collections. This is an interim measure until I reach a decision about how best to collate content outside of Google Plus. Those collections themselves are not being updated as I would prefer to work on a replacement instead. The website is back operating again as I have been in contact with the domain hosting company (Domains4less) who have apparently decided to have this great idea of migrating their domains to a new platform without, it seems, informing me. Because their new system only lets me redirect one URL to trainweb, the site will be changed to have just a single page, that will link straight to Google Plus for 12 collections (one for each volume), as well as other major sites the project uses. This will be easier for me to maintain because I can't use FTP on my filtered internet connection, since trainweb requires FTP for maintaining web pages. So right now there is a home page but none of the page links to separate volumes will work. Tomorrow I have to fix up the home page with some changes and then upload that. The best part of it is that the page will then be a static page, with all changes being made in the Google Plus collections. People can subscribe to and follow these with a Google account, or they can follow Facebook or Blogger. This is actually redirected to www.trainweb.org/nzrailmaps which is hosted on a server in the US. At the moment the company which hosts my domain nzrailmaps.nz, Domains4Less, seems to be having some sort of meltdown (so it would appear) and if you visit the home page which is mentioned above you will just get a page saying the domain is parked. This is actually not true at all. There is obvously some issue with this company and they have not responded to my queries so far which is not very good so I may have to consider changing to another domain host but this is not what I expected to happen and I don't have a lot of money to spend on domain hosting and it may well be the case that the website address will be down for a considerable period of time until I can sort something out. 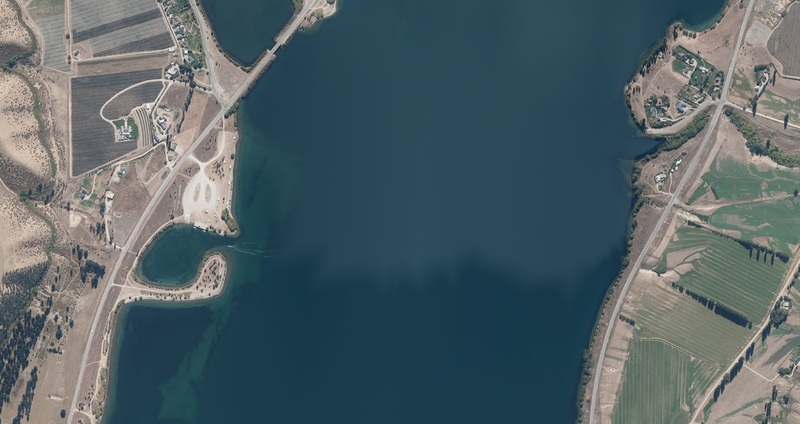 Last time I was talking about the challenge of aerial maps of the north part of Lake Dunstan. All of Lake Dunstan is of interest for historical purposes due to the hydro development resulting in indundation of a considerable area of land. Just as an aside I am about to do a map of Lake Karapiro which is an interesting one because it submerged the Horahora power station in the lake. Anyway carrying on with Central Otago here is a sample of Clyde. The new Clyde mosaic is the second largest ever (north Lake Dunstan is the largest) that I have worked on. 8.9 GB and that is much increased from the previous version of Clyde which is only 1.9 GB. That's essentially what it takes to do the maps at the higher resolution and quality with the LINZ tiles doubled in pixels in each direction therefore four times as many pixels overall, and in this case enough imagery to depict eight different periods: 1962, 1972, 1978, 1979, 1981, 1985, 1991 and 2014. As it happens there isn't always aerial photography for the whole area for every single one of those periods so they can be made up of images from two slightly different periods. So this image and others of the same series will be labelled "1962" but in fact the 1962 stuff I have only covers the main part of the first Clyde station. The part coming down into the 2nd station site is actually lower resolution stuff from 1958, but the 1962 survey isn't fully online yet, only the parts I previously paid to have scanned from Archives New Zealand are useful to me. Another mishmash example is 1972 which is the NZR surveys of the 1st Clyde station combined with some 1977 stuff.I have however checked what I can get from 1974 and 1976 and am reasonably confident that this so-called "1972" stuff is reasonably close to what was actually there in 1972 across the 2nd site. There wasn't enough difference between 1972 and 1977 across the 1st Clyde station to justify a different era of imagery for that site. Anyway all the tiles have been made and imported into the maps ready to go. So I have been working on two mosaics in particular, the ones of Lake Dunstan from Cromwell to Luggate, and the ones of Clyde, over the past week but not as much as the previous week but that is what happens with ebb and flow of different time commitments etc. The Lake Dunstan ones are complete. I am not going to show any more previews at the moment but just talk about the challenges as they have involved 72 current aerial photography layers from Linz in a matrix 8 wide and 9 high, plus three historical layers from Retrolens - a total of 75 layes. When you work out the numbers that is around 2,000,000,000 pixels which is a lot, and in the XCF file that is a 12 GB file. That is easily the largest GIMP project I have ever worked with, and very much tested the limits of my dedicated graphics computer with its 16 GB of RAM. 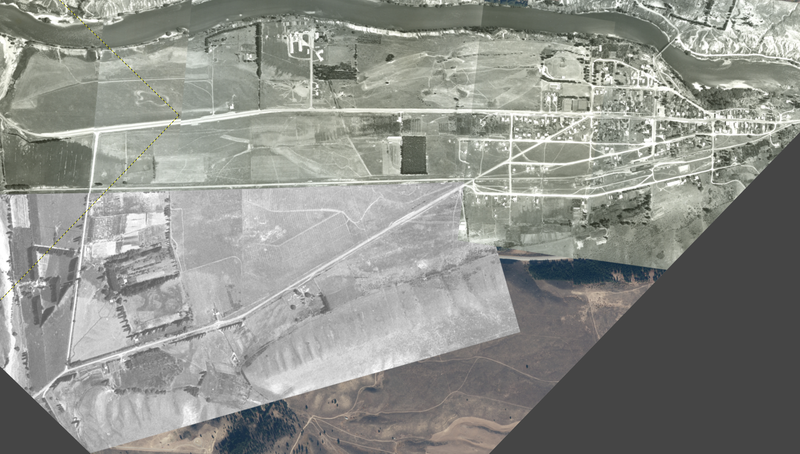 When it came to rendering out the aerial maps for Qgis, they have been divided into six large tiles each of which consists of 12 of the original tiles (4 wide and 3 high) and these tiles are up to 200 MB each in size as a JPEG at 100 quality. The resource demands were such that I could only crop and render one of these six tiles at a time before Gimp ran out of resources and crashed (when the CPU, memory and swap meters were all maxed out) so I had to keep closing Gimp and reopening it to do the next tile. Qgis also has trouble handling them even on the map drawing computer with 32 GB of RAM and again I am seeing maxed out CPU, memory and swap and have had to put these images into a separate project just for this section. The next thing of course is to draw the map details and then produce the final images. The main intention of this post as far as pictures go is to show the progress on Clyde. This image is from the Gimp project to re-mosaic the Clyde historic aerial imagery at a higher quality by scaling up the Linz layers to four times as many pixels so that we don't have to scale down the historical images so drastically and lose so much of their high quality (mostly the NZR surveys which they intended to show a very high level of detail on the ground). The second Clyde station with the turntable and engine shed upper left and the freight shed upper right. All of these features still exist today. Part of the old station site with at far left the engine shed foundations (not sure when this closed) and towards the right hand side you have the turntable pit and one of the houses at this end of the station yard. The railway precinct at Clyde covered a significant area compared to some of the other stations, perhaps reflecting the fact that it was originally expected to be the railhead. 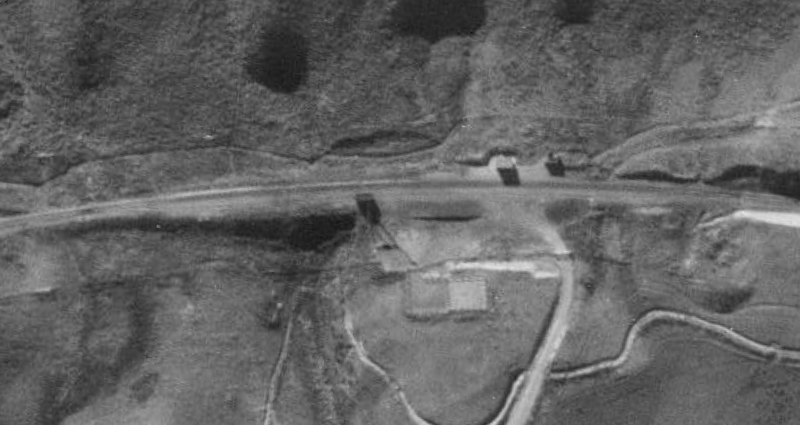 There were at least two areas of housing in the yard and at least six houses of which several remain today, but there is no obvious trace of the turntable or engine shed foundations on aerial photography and a considerable amount of the station yard has been built over since the station closed in 1980. I am still doing the rest of the mosaic which will cover up to 1991 when completed and I expect it will be completed today so that the map tiles can be produced and brought into the maps. 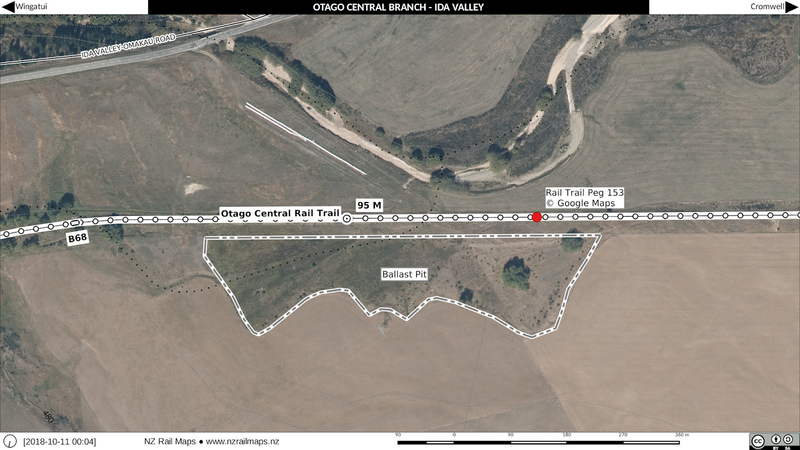 Not the railway, but this is what I have been working on for the Clutha valley north of Cromwell. The area on the left is called Lowburn and on the right is Northburn. The Lowburn bridge was built in the mid 1930s and replaced a punt. The old NZMS1 map of the Clutha valley from Cromwell north. Lake Dunstan covers about 1/3rd of the distance from Cromwell to Wanaka, the river's source. There have been in the past plans for hydro development at Queensberry and Luggate but nothing has eventuated. The Clutha is further dammed downstream of Clyde, at Roxburgh, which was built in the 1950s. After 60 years of faithfully serving the local community, the Lowburn Bridge was submerged beneath the rising waters of Lake Dunstan as the sluice gates on the Clyde Dam were closed to fill the hydro lake. The bridge is still there at the bottom of the lake with an old car sitting in the middle of it. 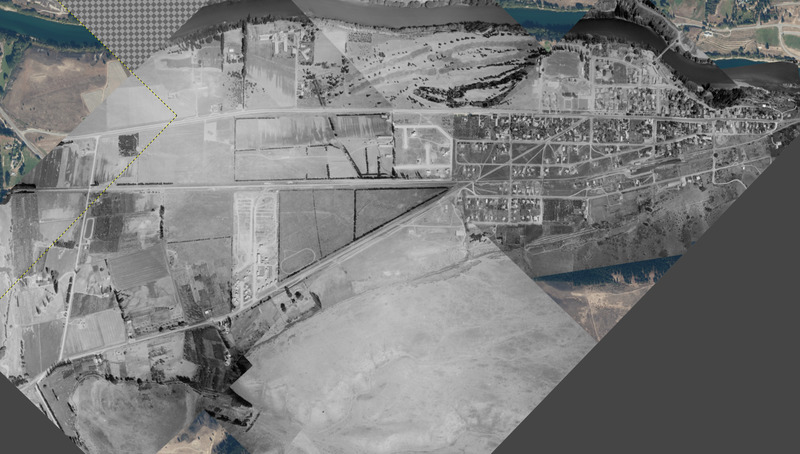 In the past few days I have been doing newer higher resolution aerial mosaics for Clyde. Here are screen dumps of what has been completed so far. The main line was diverted and linked to the original line to the 1st station and Cromwell. The new highway occupying the original railway corridor through the south of Clyde was under construction. The 2nd station was open and the original line to Cromwell was lifted. 198x: The 1st station site saw the goods shed relocated to the museum site nearby. 1991: The 2nd station was closed and the line lifted. The remaining aerial photos will be added today and the maps redrawn. I have spent a lot more work on these maps than on the originals and of course I have the high resolution aerial photography and are using double size LDS tiles so the quality will be higher particularly with the NZR survey of Clyde incorporated in the 1970s generation. So the Cromwell maps took a little longer because I had to make bridge tiles to bridge the gap between the new aerial imagery and the old stuff I have for the rest of the gorge. So that there is a fairly seamless join between the new tiles and the existing ones. The bridge tiles are a regular 9600 pixel width (LINZ's 4800 width tiles doubled in each direction) but a special height of 9599 pixels to line up with the existing tiles, and why this odd size? Well, the existing tiles are funny hybrid ones which were originally 0.75 metres resolution and I found some way of scaling 0.4 metre tiles to overlay on them to update the base imagery to a higher resolution without having to redo everything from scratch. And because of that the 0.4 metre tiles don't line up perfectly with them when you mix 0.4 metre and 0.75 metre derived tiles in the same map. 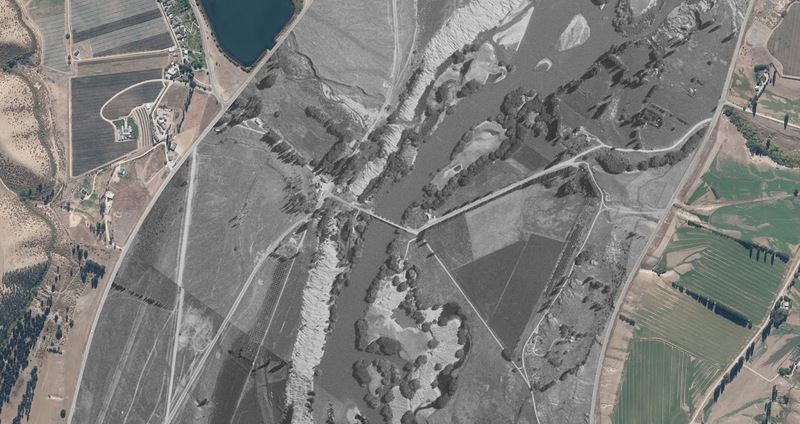 So the bridge tiles have had to be cropped to a specific size that will fit exactly in the gap and part of that was to overlay another 1965 aerial photo over the old 1962 ones and make it line up almost perfectly at the join. So here are the completed maps for Cromwell. The next stage is Clyde which will be started today, and then Alexandra which will include the aerial photo for the Fulton Hogan siding. At the same time I am working on the head of the lake mosaics as there is enough imagery to get to Lowburn for a start (another drowned bridge there) and hopefully there will be enough good stuff to get all the way up to Mount Pisa where the lake turns back into a river. I still have to muck around with the masking and the lake and riverbed layers to get them the same as what I did with the older aerial photography. 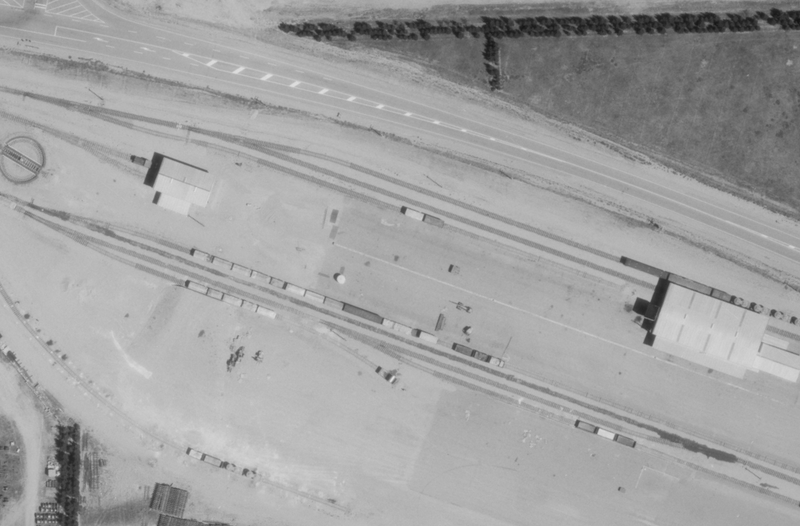 I also got a low res 1958 layer to give me the position of the original goods shed. As mentioned yesterday I am now working on new maps of Cromwell and hope to get some coverage that will also give me the valley going to the top of Lake Dunstan in conjunction with the Cromwell Museum to have full coverage of the historical appearance of that area. After some experimentation I am doing new mosaics with much larger geojpeg tiles for Qgis because the new imagery is of such a high resolution that scaling it down to fit the old mosaic tiles lost far too much detail. This entails getting the highest resolution tiles available from Linz Data Service and scaling them up so there is more of a match in size for the Retrolens stuff to drastically reduce the scale down and loss of quality on the latter. This will be for Cromwell station and Clyde station only. I am not redoing the gorge which would take much too long, instead I will use the existing Gorge stuff that I have as it does not need to be at a higher resolution as there is not much detail on the ground. Alexandra - in addition to the early 1980s NZR survey an older one from the early 1970s has turned up. I expect to finish the Cromwell mosaic today and probably start the Clyde one tomorrow, then redrawing the maps will be quite fast so this is not going to slow things down much. Yesterday I wrote about getting new aerial coverage for the stations in the Ida Valley (Auripo, Ida Valley and Oturehua). It has only taken a little bit of time to create or update mosaics for the first two and Oturehua will follow shortly. Once that is completed the maps for all three locations can be re-finalised and then produced. 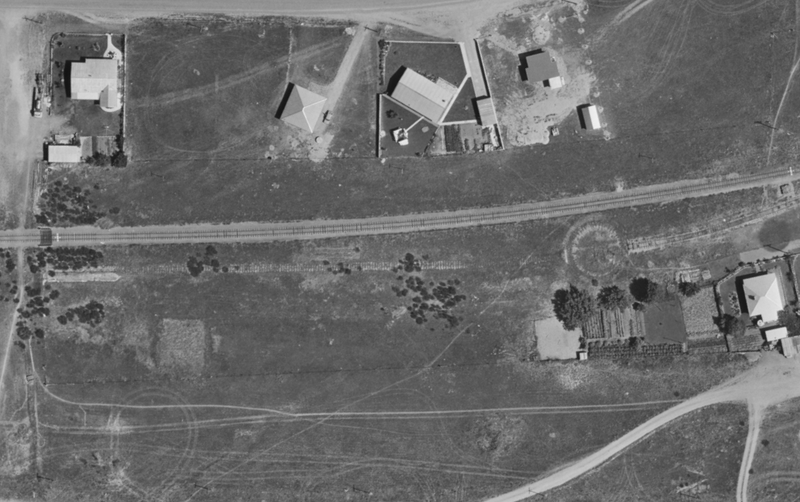 Having been looking at aerial photography in various areas around the Otago Central today, I have discovered the official NZR surveys for both Cromwell and Clyde, which date from 1972. 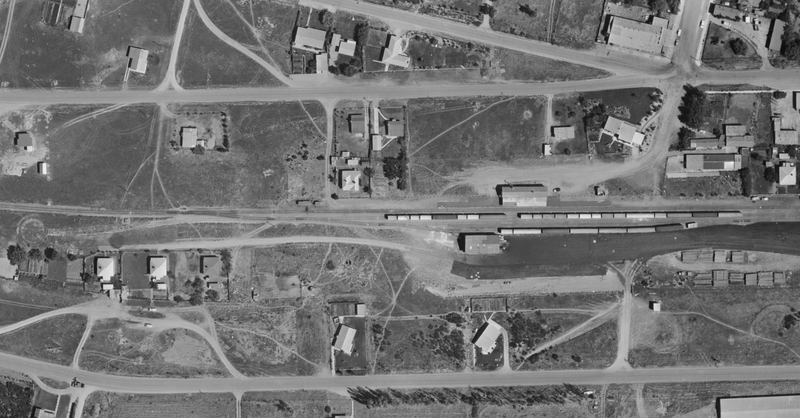 As this is of much higher quality than the 1960s aerials that I previously used for the maps of these stations, I expect to cascade this new stuff into the existing map mosaics and then redo the maps of those two stations accordingly. At the moment I have not scheduled exactly when this will take place. It might be next week or it could be further down the track. As the images below show, the quality is very high. Cromwell above and Clyde below. In the Clyde photo you can clearly see the turntable pit in about the same place as on the Cromwell picture. The Clyde turntable was removed in the 1950s, probably when dieselisation was imminent. Clyde also had an engine depot, which went quite a bit earlier I believe. Both facilities would date probably from when Clyde was the railhead 1906-21 but it is surprising the turntable lasted for so long. 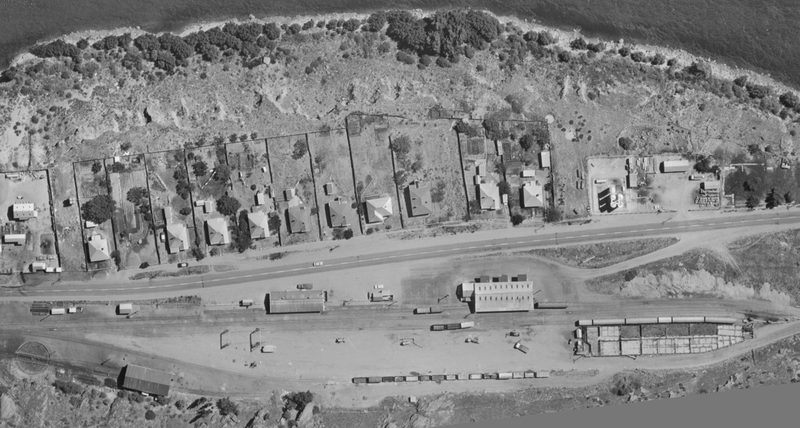 In the course of looking at some stuff around Dunedin I have found Retrolens now has aerial photography from 1942, and also the 1960s and what appear to be official NZR surveys from 1972. 1960s coverage varies. Year 1960 coverage is not for the whole railway network in Dunedin, while 1967 coverage is at a lower resolution. The official 1972 surveys seem to be the best bet of getting anything from earlier than 1978, and crucially for my interest, they do include the old Dunedin locomotive depot, which must have been almost closed. As I already have 1978 it will make for an interesting comparison. So then I expect to add the 1942, 1972 and 1985 or 1986 coverage which is what is available, to the 1978 that I already have. There is no particular timeframe for completing these at this stage. Survey 112 of 1939 which is now available. The only higher res coverage for when it was open. Survey 112 of 1939 now available. Again the only higher res coverage for when it was open. Survey 890 (1956), 1745 (1965) and 5800 (1980) should cover well. 890 in particular is important as it gives the best early coverage which probably will show the old locomotive depot and turntable at the north end. As far as I can tell none of these are available yet. Survey 112 goes close to Ranfurly but not actually over it. Survey 2590 is available. This looks like it is an official NZR survey as it only covers the railway yard. 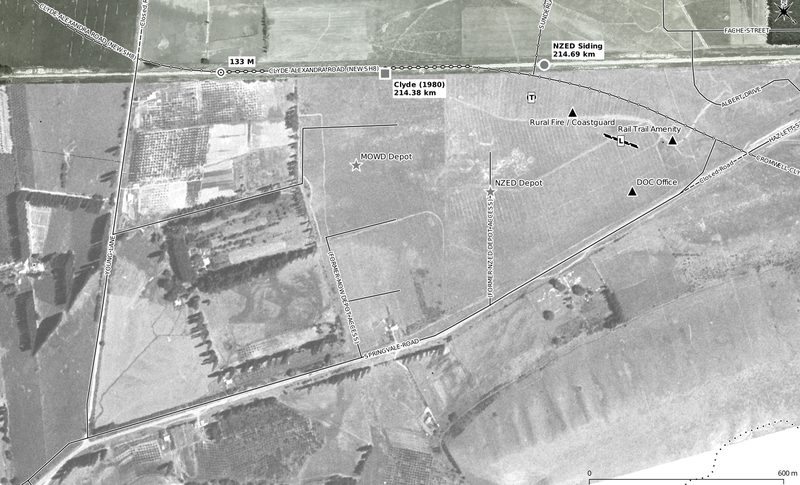 Taken in 1973 it will let me publish full aerial maps of Ranfurly. Survey 2833 is the only really good coverage of Waipiata. Again it appears to be the official NZR survey that was taken in 1975. This is good as there is really nothing else suitable for Waipiata. NZR must have had reasonable confidence these two stations would be staying open to have these surveys done as there are not these surveys in existence for every station. The ballast pit when the siding was opened is not covered in anything I can find. I have found lower res images from 1959 and 1960 (Surveys 1053 and 1214) which were 7-8 years after the siding was removed. It does give a clue as to what the pit looked like in that era (it was kept open without a siding because NZR used trucks to bring ballast to the Hyde yard to be loaded there). So it should be possible with that to estimate where the siding ran, which will be marked as "uncertain route". I do have some data for the siding that should help with the route, but not an actual map. There is some 1940s coverage now available which should be reasonably sharp but is actually not too good (I don't know whether it was a bright day or if the scanner overexposed the scans as they are a bit washed out). I will see if that coverage is useful. In many cases I have now obtained station diagrams from Archives Dunedin. I have some Dunedin City aerial photos and a bit of Retrolens stuff. I am unclear how useful that stuff is. I have also obtained station diagrams. So there we have it. The original post linked above also had diagrams taken from the aerial footprints layer to show coverage through the decades. It is interesting to view those diagrams in relation to the map of the line. From the Ida Valley the route goes through the gap between Rough Ridge and the Idaburn Hills down into the White Sow Valley, and then through another gap at the north end of Little Rough Ridge to Wedderburn. Essentially we call this the "Wedderburn Summit" or "Wedderburn Pass". From Wedderburn down to Ranfurly and Waipiata is in the Maniototo Plain and railway-east of Waipiata the railway follows the narrow valley in the upper reaches of the Taieri River closely until Hyde and then the Strath Taieri through to Middlemarch. Railway-east of Middlemarch the line gradually closes in on the Taieri River valley, finally entering the gorge east of Pukerangi and eventually exiting at Taioma, descending through the hills until it enters the Taieri Plain at Wairongoa. The last few kilometres is across the relatively flat Taieri Plain to Wingatui. These probability scores reflect the availability of suitable aerial coverage or diagrams. For something that has an L score, you will most likely only see the station site marked but not any other detail. In some cases there was nothing at a specific location, it was just a stop on the main line with no infrastructure. In other cases I can't get a diagram or aerial photo. So North Taieri Tanks is just going be marked because there was never a siding, Machine Creek which isn't in the above list and the water tanks at Prices Creek, Mt Allan water tanks, Little Mt Allan halt with no siding or shed and the like will just be marked as a point on the line. As far as miscellaneous sidings go like ballast sidings that are on the chainage charts, the points and direction will be marked (and the length if known) but not the actual route because that often isn't clear. Ida Valley pit doesn't have a siding marked but the water tanks and coaling facility are marked. There are a lot of little details like that that will be marked wherever possible but not with much clarity because that's just the way it is. There is still a lot of work to do with the maps and I expect this to continue into next year and it is hard to say how long it will all take but I can't see it taking more than 12 months but I am not really sure how long is needed. The subsequent posts to this one will finish the 63 Ranfurly-Alexandra series so it will be a while before you see [64B] and subsequent posts in the 64 series for Middlemarch-Ranfurly. 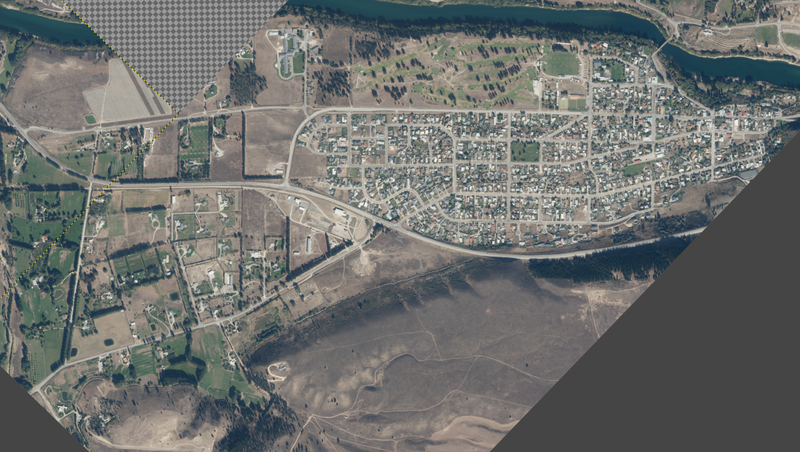 Whilst working on the maps of Oturehua I took a look at Retrolens to see if any different aerial photography of the area was available. 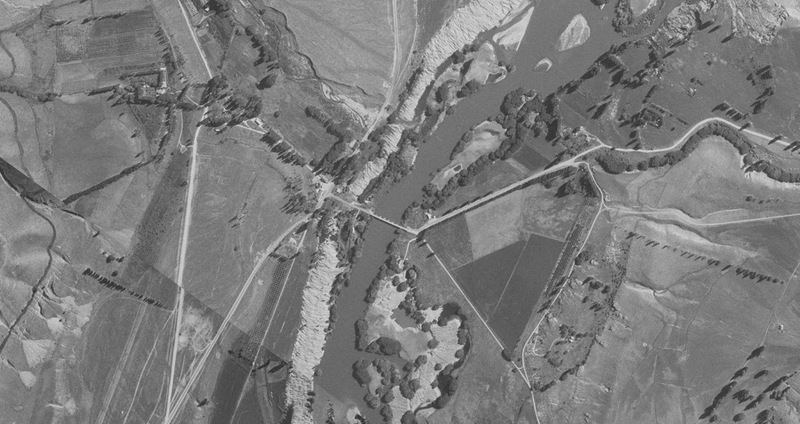 It was very pleasing to discover that new imagery from Survey 112 of 1939 has recently been uploaded for Oturehua. There will be a delay in completing these maps while I add this coverage to the existing mosaic so that I can use this to confirm some of the details missing from the 1982 coverage. Based on my knowledge of this survey I knew it would also cover Ida Valley (of which to date there has been no high resolution coverage on Retrolens) and Auripo so I went and looked at both areas. 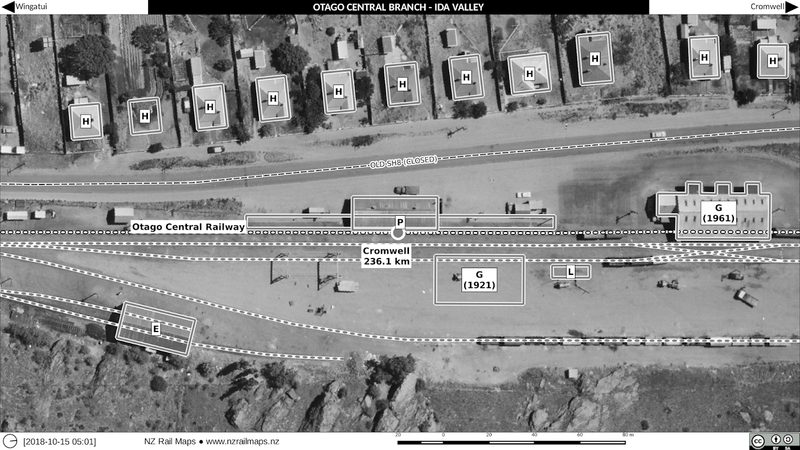 The result was most pleasing as it confirmed that there is now coverage of Ida Valley and going back far enough to confirm a lot of details. Most importantly it confirms some differences in my map compared with the ones in Dangerfield & Emerson. 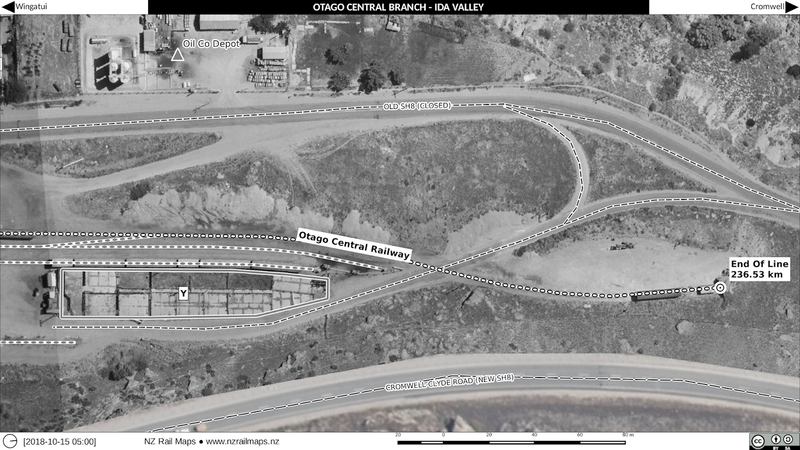 Naturally there will also be delay to create a mosaic for Ida Valley and then update the map details. I also knew there would be coverage of Auripo in the same survey so I looked that up as well and sure enough I managed to turn up an image of Auripo from the same date. Again this will be added to the mosaics and used for updating maps. So now instead of having completed these stations there is a bit more work and delay but it is worth it. Survey 112 is a very large survey and it's no surprise it has taken this long to scan all the images. This same survey is possibly able to give me some data on Ranfurly and Waipiata which I don't yet have for those stations either. 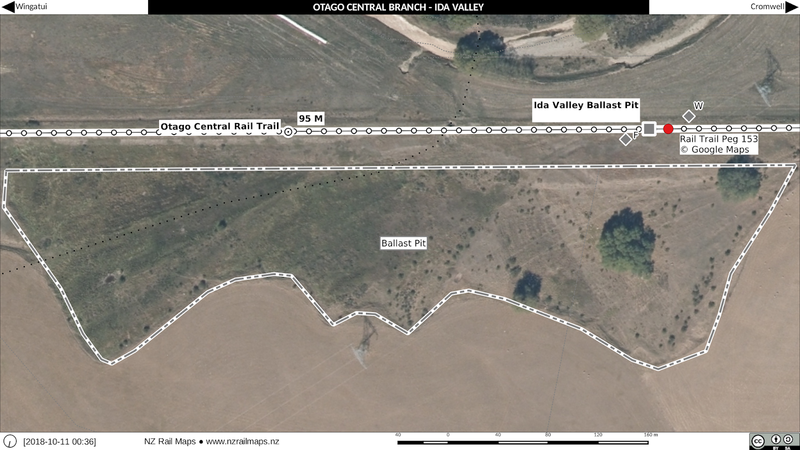 Ida Valley Ballast Pit is located near the 95 mile peg of the Otago Central Railway between Ida Valley and Oturehua. It was open only during the construction era - between 1903 and 1904 - and was a tablet station. Because that latter fact I now have to locate exactly where it was and mark it on the map as a closed station. Here is the amended map. 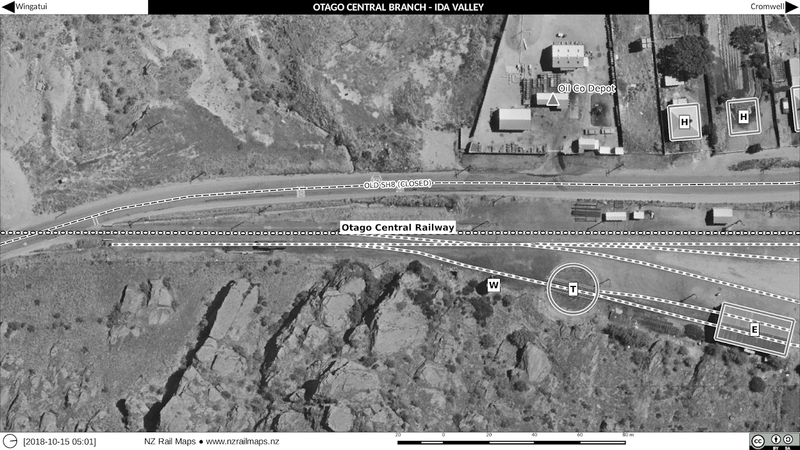 The locations for the coaling and watering facilities are correct, however the exact location of the tablet station is uncertain. At the present I am having a lot of computer free time for a break so there will be no progress on maps work until mid October. The station map tiles for the Methven Branch have been completed, while those for the Springburn Branch will be started soon.